State Sen. Paul Formica, who chairs the newly-minted Arts, Culture and Tourism Caucus. Lucy Gellman Photos. Hartford—Update Connecticut’s highway way finding signs. Turn shuttered welcome centers into safe texting locations with local information and clean bathrooms. Stop saying that Connecticut is “Still Revolutionary,” because it doesn’t resonate with Nutmeggers. And make the state a place that people want to stay—not just for their vacations, but maybe for their whole lives. That’s the work that the newly-minted Arts, Culture and Tourism Caucus has cut out for itself this session, as it gets behind a number of legislative items that could grow arts, culture and tourism funding in the state. 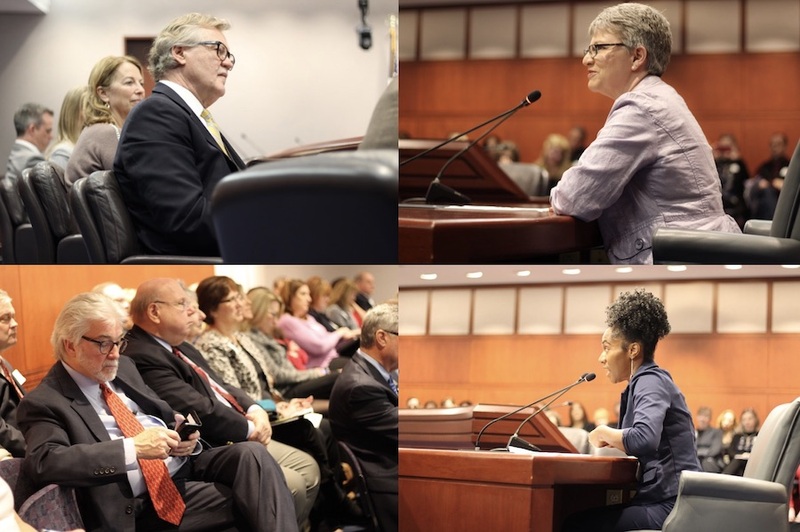 Monday afternoon, caucus members gave that update during an hour-long public meeting at the State Capitol, filling every seat in a hearing room during an annual “Arts, Culture and Tourism Advocacy Day.” Over 200 legislators, nonprofit professionals, and tourism advocates attended. 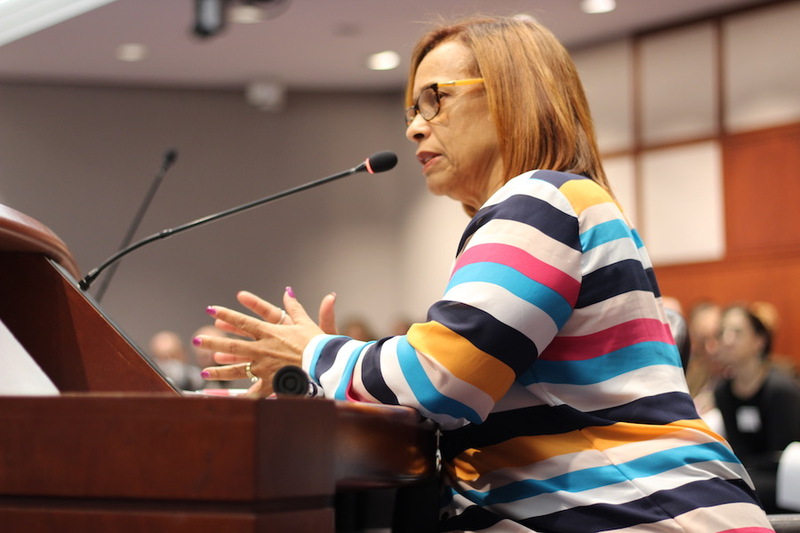 The caucus also voted Monday to change its name to the “Arts, Culture and Tourism Caucus,” a move that members of the Lamont/Bysiewicz Arts, Culture and Tourism Transition Team recommended last year and again in January. Clockwise, from top: Formica, SHPO Interim Director Liz Shapiro, CT Office of the Arts Program Associate Adriane Jefferson, and Randy Fiveash. Now, it is looking at a number of actionable items that it can get behind in the coming months. West Haven Rep. Dorinda Borer, who co-chairs the committee with State Sen. Paul Formica, recommended that her colleagues—and attendees—voice their support for House Bills 7306 and 7307, both pieces of proposed legislation that would funnel more money into arts, culture and tourism for the state. She said that caucus members have already put bipartisan support behind the bills, both of which are waiting to be heard on the House floor. If passed, the first would require the Department of Economic and Community Development (DECD) to study and implement the findings of a Blue Ribbon Panel on Tourism led by State Rep. Joe Aresimowicz. Earlier this year, the panel made a series of recommendations that include reopening and staffing the state’s welcome centers (“more like unwelcome centers,” quipped Waterford and Montville Rep. Kathleen McCarty), creating a five-year strategic tourism plan, and rebranding the state’s long-suffering tagline, the work of Missouri-based advertising firm FleishmanHillard in 2012. Legislators took a particular interest in the last, pressing Office Of Tourism Director Randy Fiveash and DECD Deputy Commissioner David Kooris for details on when the state’s tagline might change, and to what. Both State Sen. Christine Cohen and State Rep. Heather Somers suggested that “Still Revolutionary” simply isn’t working; Somers noted the much more memorable “Virginia Is For Lovers” campaign that rolled out in 1968, and suggested that the office include focus groups before changing the tagline. In response to questions, Fiveash said that the office and marketing agency Adams & Knight are already working with a third-party firm for that rebranding research, and expect answers “in the next six to eight weeks.” Adams & Knight did not respond to multiple requests for more information. In getting behind the Blue Ribbon Panel's recommendations, Connecticut Tourism Coalition President Stephen Tagliatela also suggested advertising welcome centers as safe texting locations, an idea he got while traveling through Ohio, and realizing that "texting is the new drunk driving." 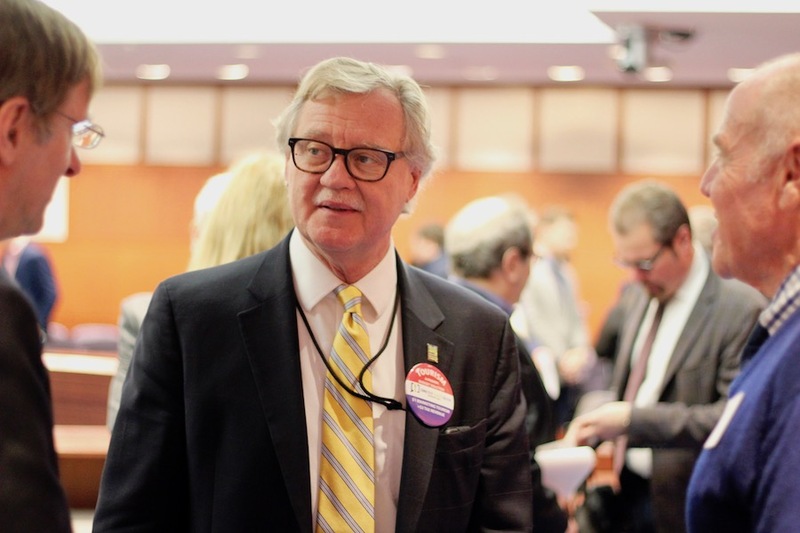 The caucus is also moving to support bill 7307, which would send 25 percent of the state’s lodging tax into the Connecticut Tourism Fund, up from a current 10 percent. Last year, members of the transition team projected that such a reallocation would raise the state’s tourism budget from $4.1 million to $18.9 million per year. That’s good news for Fiveash and for legislators, who are watching as Connecticut tourism gets massively outspent by New York, Massachusetts, and Rhode Island. “We are one of the few industries that puts money back into the state,” Fiveash said. 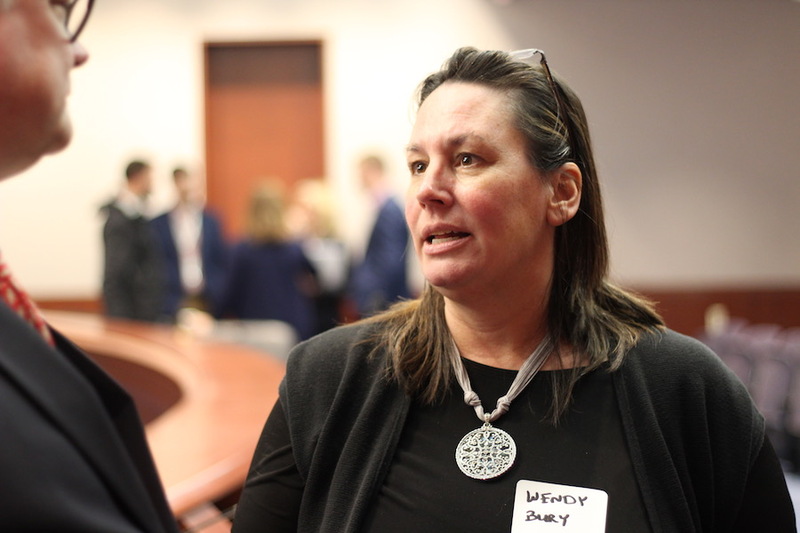 He echoed Wendy Bury, executive director of the Southeastern Connecticut Cultural Coalition and transition committee co-chair with Tagliatela, on the high return on investment that both arts and tourism have in the state. 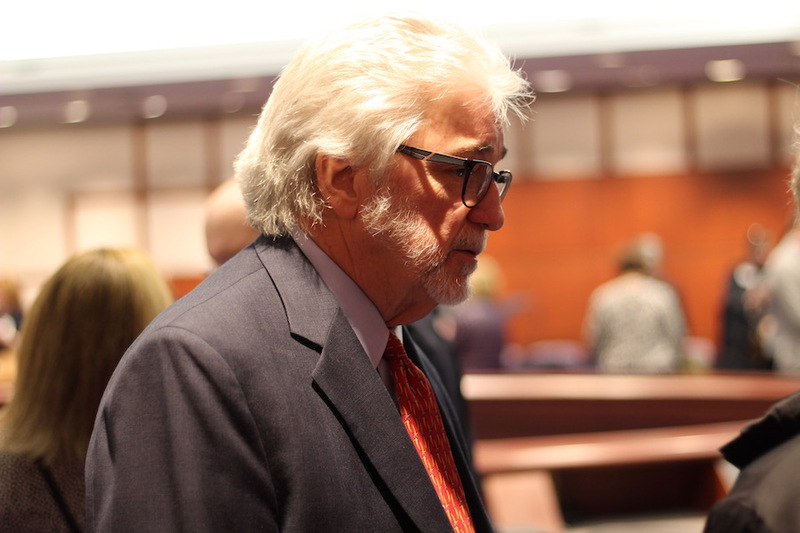 In addition to the bills, he urged legislators to voice their support for the panel’s recommendations, all intended to make the state more welcoming. 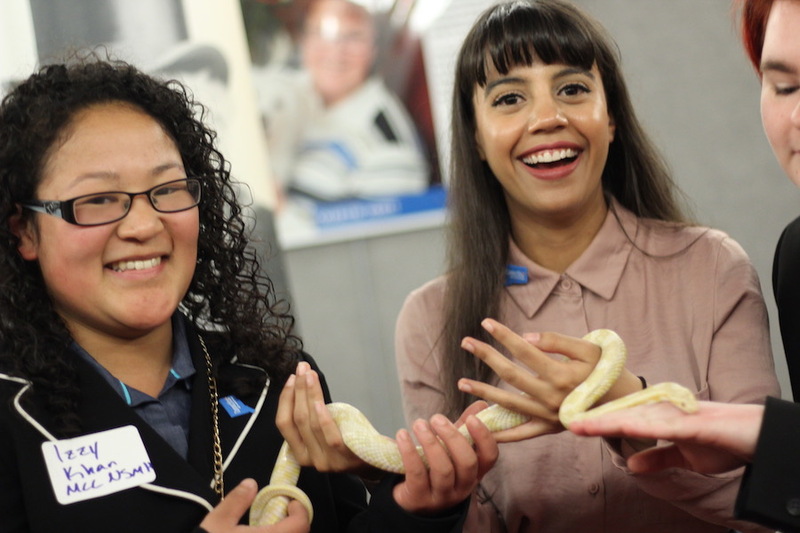 After speaking, Andreia Neves and fellow Manchester Community College students made another friend from the Beardsley Zoo. During the day, the zoo was one of several cultural organizations to table out in the hallway of the Legislative Office Building. There from Manchester Community College’s hospitality program, student Andreia Neves suggested that the tourism in the state needs to step up its marketing game—or students trained in hospitality and management won’t have any economic incentive to stay in the state. Noting that both she and her peers are making an investment now, she said that she fears not being able to find work in the state’s industry, an outcome that would lead her to seek work in nearby states like New York, Massachusetts, Rhode Island and New Hampshire. “The sum of our greatest fear is the lack of tourism marketing,” she said. State Historic Preservation Office Interim Director Liz Shapiro (pictured in collage above) took a more personal tack, describing long summers spent in her family’s minivan, taking weekend trips to towns in the state. From late spring into early fall, they explored the state’s nooks and crannies, celebrating its museums and aquariums, parks and bursting foliage at the end of peak tourism season.